I'm sure that most readers have their frame size dialed-in. Our customers are generally experienced cyclist who've owned enough bikes to know what fits. But we do get an e-mail every week or so asking advice on frame size selection. So here it is. I generally recommend getting a traditionally-sized frame, one that's larger than many race bike oriented shops would recommend. The traditionally sized frame will allow you to get the handlebars to proper height without a super-tall stem. And it will allow a reasonable stem extension that does not put too much of your weight over the front wheel. The frame will handle better, be more comfortable, and you'll look better riding it. Start by checking not at the frame's nominal size but the frame's stand-over height. This is the height of the top of the top tube of the bike with the size tires you'll use. Looking at our frame geometry table you'll see that the stand over height for a 51mm VO Polyvalent is 748mm with 38mm tires. Adjust for tire size, if you plan to fit 32mm tires, subtract 6mm. Most folks will want about 20-40mm clearance between your, ummm, nether-regions and the top tube. A bit more, or less, may be preferred by some. So the next step is to measure your personal stand-over height, or pubic bone height (PBH). 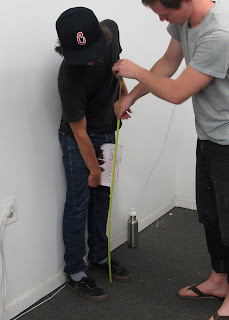 To measure PBH put on your cycling shoes and stand upright with you back to a wall. Spread your feet to about the same width as bike pedals. Now hold a large book square against the wall and raise it firmly against the aforementioned nether region. Have someone measure from the floor to the top of the book. Do this carefully to the closest millimeter. That is you very own PBH. With PBH in hand we can select the frame size based on stand-over height. You'll also want to check that the top tube length will work for you. Many years ago I learned a method that's simple and gives you a good starting point if using drop bars. When on your bike, with hands on the brake hoods, look toward your front hub, the front axle should be hidden by the handlebars. If the stem extension is reasonable, between 80mm and 110mm, and the saddle rails are clamped to the seat post at, roughly, their midpoint, you have a top tube length that's about right. 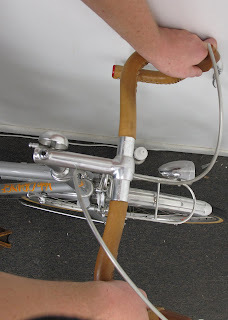 Now some will take me to task as this method has fallen out of favor for being old fashioned and imprecise, but it's close enough that you can adjust the saddle and stem length to fine tune fit later. So try this on a few bikes and measure the top tube length of the one that fits best. Measure from the center of the seat tube to the center of the head tube along the top tube and compare to the frame geometry chart. I think it's more important to get the top tube length right than the stand-over height. Of course this method is not going to work if you plan on using upright bars. In that case go for the longer top tube since upright bars generally sweep back. Remember that this post is about buying the right sized VO frame and this method will do exactly that. You'll need more information and experience to find your best position on the frame (or to order a custom frame). A good place to start fine tuning would be by reading Bill Boston's site. Doesn't this sort of ignore seat tube angle (STA) and saddle type? For example, on a bike with a steepish STA and a Brooks saddle, it's unlikely that the rider will have the saddle clamped at the rails' mid-point (even with an offset saddle). VO frames have seat tubes at around 72-73 degrees (except the smallest sizes) and I'm assuming a Brooks or VO saddle. You might move the saddle back 5 or 10mm, but you're in the ballpark. By chance, I was measured four days ago by a man with 30+ years experience. It took at least two hours, including measuring my favorite bicycle, my body including verifying equal leg lengths, etc - referred to as "shop theater". Thena five mile bike ride to anylize my posture and riding style - designated as "road theater". The most disturbing thing I learned was I've shrunk over 2" in the past 40 years. Why are we concerned about stand over height? When I stop I kind of slide side saddle, tip the bike and drop my left foot to the ground, saddle remaining under my right thigh, right toes still on the pedal. In essence the stand over height is the top of the saddle. I'm guessing few people stand over the top tube. My thought for the day. Well, my second thought. Boy, you sure opened up a can of worms! For distance from saddle to handlebar (I'd rather call it that than top tube length), I rely on the other old method, that is to place your elbow against the nose of the saddle and extend forearm and hand forward to the handle bar. If you can rest the tips of your index, middle and ring fingers on the bar, you should be ok.
isn't this basicaly the rivendale method? or did rivendale get it from somewhere also? ps i've never seen brook seats positioned anywhere but slammed all the way back. might be a better starting pt. I've been measured for custom bicycles a few times by frame builders and comparatively they take very basic measurements. For whatever reasons, the race-oriented bike shop i've visited requires upwards of an hour or more measuring you for bikes and at a premium cost. Over the years, I have acquired the ability to pretty much dial myself in starting with PBH and some tweaking during my ride. Where was the "book" method as stated in the article "...Now hold a large book square against the wall and raise it firmly against the aforementioned nether region" meaning the PBH taken from you ask? This method reads much like that mentioned in the 1987 book "Greg Lemond's complete book of bicycling" and that section starting on page 120 is indeed called "The French formula for perfect fit." So, that book is fairly common if anyone wants further reading on that. I agree too, this is a principle I've heard: "When on your bike, with hands on the brake hoods, look toward your front hub, the front axle should be hidden by the handlebars." Right and look at photos where one can see this of any cyclist on a road bike, this is almost always the case with the pros and it also gives one a fudge factor in working with the handlebar stems, one can lengthen or shorten the geometry a bit. This is why I also enjoy vintage vintage books on cycling and the bike boom has a # of classics. I'm very familiar with my frame size only VO stops @ 63cm. Ever contemplate a run of bigger sizes? can o' worms, Pandora's Box? whatever you want to call it -----Chris you opened it, close it quickly !!!! My last two bikes/frames have had 72.5 and 73 degree STAs. Brooks B17 CS saddles on both, mounted on seat posts with lots of offset (VO on my current bike). Given the Brooks' rail positioning and my long femurs (and heels-down pedaling style), there is no way my Brooks' rails would ever be centered on the post's clamp. I'm not alone here, either. A quick google search will reveal that there are tons of people out there who need "just a little more offset" to get their Brooks saddles back far enough (even on bikes with 73 degree STAs). In general, I agree that this is a can of worms. I remember the front axle thing, and used to use that in the 70s, but I wouldn't see it as relevant now. Too many variables (fork length, rake, hta etc.) to count on that as a guide. I can tell you that I have a few bikes which fit great, and none are set up like that with the front axle/handlebar. Similarly all the old formulas, KOPS, the forearm thing, and Lemond's included, are all utterly and completely worthless to me--not even close to being meaningful--and I would not recommend any of them at all for anyone. Those formulas are garbage. The best thing to tell a buyer, in my opinion, would be to test lots of bikes, day after day, learn your contact points, get the sta, effective top tube and head tube length of every bike that fits, write everything down carefully, and figure out the range that fits. It's a hands on thing, and it's not hard but takes patience. A bike fits if the contact points are where they need to be, period. This has nothing to do with sightlines or formulas. There's no shortcut to figuring where they need to be--it's trial and error, riding, measuring, and sometimes a good eye from a trusted builder or shopowner can help. I once met an Italian framebuilder in his 70s who knew my size to the millimeter the second I walked in the door, and he was right. He just knew. If you don't have someone like that, it may take a while to learn your contact points, but it's really not voodoo or rocket science. Figure it out. To me, that seems like a totally nuts way to stop on a bike. I slide forward, off the saddle, and stand with my left foot in the pedal at 10 o'clock and my right on the ground. When I get going, I get going with the left pedal and simultaneously sit back onto the saddle (or pedal standing for a couple hundred feet to get up to speed). Maybe this is because my bikes are all old and have flat top tubes and I like about .5-1cm of clearence between the top tube and my crotch and would have difficulty reaching the ground while sitting on the saddle. MW: Thanks for the specific tips on the correct frame size, er, or should I say lack of unless we've got a special frame builder waiting in the wings. And these methods previously stated are not relevant today? Hey, I'm not looking for an aluminum or titanium frame with a carbon fork. But thanks all the same. no, I'm sorry, but those methods are, to me, not relevant. Reach and saddle height matter, bar drop, etc. in fit. Other issues matter to what the bike does or how it handles. There are many ways to get to the right contact points. Take Gunnar's observation about bb drop. How does this impact the other formulas? Well, if you use the handlebar sighting thing, then drop the bb 5mm, then that obviously changes the sightline, but it would not necessarily mean that you need a different stem. It's just a lower bb, that's all, and shouldn't have much effect on fit. if I dropped the bb, extended the front and rear center (i.e. made a touring bike), then all the sightlines and clearances are different but the fit is not necessarily any different at all. All of the shortcuts share similar problems. The Lemond method is one of the worst. It measures according to one of the least important dimensions imaginable--the seat tube, center to center, which has nothing to do with reach, bar drop, or even seat height. This might be ok for a young racer--well, on second thought, no, it's not ok. It was always a crazy way to size bikes, and I know it led me to a couple of bad mistakes which I could've avoided if I just tested bikes, trusted my own body, maybe even found a good fitter, and ignored all the formulas. 2. With hands on hoods, look at the angle between your torso and upper arm. Should be in the 90 degrees neighborhood. From here, it depends on riding style, fitness, intended use, etc. But as a shop employee (familiar with how different companies's size "names" related to their actual geometry), I found this method was a very quick way to figure our what size or size area a customer should be looking at, and what bikes that were available for test riding might be worth their time. I was just listing a source for this method, I have nothing to do with the politics. I said I liked reading stuff from the bike boom so from GL's book being dated to 1987, that is almost after the boom however one dates it. Other books out there are bike manuals by John Marino who won the RAAM (Race Across America) and another by Tom Douty on Long Distance Cycling. Gleim's Repair book which is actually a full bicycle manual probably has info on this as well and I forget the other book much like it out there. Bike boom Literature has a lot of hidden gems in them. With regards the front hub being hidden by handlebars, there's a very good reason why this can be "imprecise": it depend on front-end geometry, including fork rake. Think about it: the position of the hub has absolutely no relation whatsoever to fit. You can angle the fork forward and back without changing the places where the body enters into contact with the bike. So while the measure may work for some bikes, it has no functional significance. Annon, Our fork rake and head tube angles don't vary much, nor does the front hub position on most road bikes. That's why the sight method works. It may not be precise enough to fine tune your riding position, but it will get you on the right size VO frame. I think a lot of the historical fit guidelines were based on the 'average' height of men. Bodies at the ends of the bell curve (and women) don't always match to the 87% of inseam 'rule' or the front hub 'rule'. And bike disciplines are so fragmented; a mountain bike will have a different fit profile than a track bike or cross bike. It's not set in stone, but Chris' (and Grants, and LeMonds, and whoever) frame fit guidelines are a good start.